Some year I would like to make it out for the world's biggest beer party, Oktoberfest. The image below shows the Lowenbrau biergarten tent sourced from Wikipedia. The image was sourced, not the tent. Oh, and c'mon, that's a friggin' tent! Eat your heart out Mountain Hardware, next time I buy a backpacking tent, I'm calling Lowenbrau to find out where they got this one. This brew will max out the space in the kegerator. Otherwise, I'd be making more lager! On Thursday, we leave for the big island of Hawaii so this batch will get two weeks before considering racking to a secondary. The previously brewed pilsner and vienna lager are now in secondary fermentation along side this brew and yesterday's vienna agave lager. When all four are nearing the end of fermentation, I may consider a day or three for a diacetyl rest. After the short warming period, I'll begin the process of decreasing the temperature to about 38°F for lagering. Below is all four lagers crammed in the kegerator. 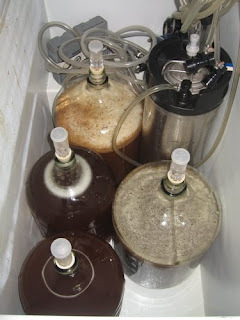 Though a keg can squeeze in, I've never managed to include a fifth carboy in there with having two primaries. A 3 gallon would fit but certainly not another 5 gallon.